I recently had a great opportunity to learn from a man who has understood a great deal about the importance of not opposing aids and centering one’s balance and joints down through the central axis of the horse. He teaches from his own experience and with the complete conviction of an artist. His name is Bernard Sachse, a Frenchman who has been a successful stunt man in the French film industry and, after a stunt accident cost him the use of his legs, continued on with his riding and became a successful Paralympic rider who has competed in two Olympic Games. Bernard and I met last fall as fellow teachers participating in a colloquium on the French system of riding that was held at the French National Riding School in Saumur. We both shared a belief in a teaching approach focused on the influence of the seat to the horse. As luck would have it, Bernard was invited to New York City for a showing of a film made from his life story. The film, En Equilibre, shows just how inspiring an individual Bernard is. Since I am based in neighboring Connecticut, Bernard and I made arrangements for him to visit my farm and my horses. Our plan was that I would ride for him and he would share some of his riding convictions, gleaned around the words of Nuno Oliveira, on lightness as a prerequisite for any form of training that would bring joy for the horse. After three days of brain storming and several technical exchanges, I shared with Bernard some of my own journey to recovery by riding for the health that riding in a certain mindset and style brings forth out of me. I needed some input from someone who understood some of the challenges of riding around injuries. Hence, I sought his feedback about a few reboots my body had managed thanks to work with the Feldenkrais approach to partial paralysis. I had managed to go far enough in my rehab to attempt to remaster such skills as tempis, levades, piaffer and canter to the rear again. But still, I was being bombarded by multitudes of bone alignment memories from my formation. I was trying to sort out which neural pathway – old or new – was shorting out my ligament attaches this winter. I was heading to France in April to look for Lusitano horses for clients. Bernard has a mechanical horse at his farm near Paris and since I would be in France, I asked him if I could study his warm up technique on the mechanical horse. It sounded parallel to the muse en selle I was taught on the lunge for balanced position development as well as a seat that is both grounded and malleable. I spent two great days feeling my way around the locks and blocks in my reactive patterns on this invaluable tool of the mechanical horse. I was able to recover motion in two bone positions in my thigh joints as well as motion around the bone fusion at the base of my back. And, I was able to practice movements and points of balance at the canter in place that had not been possible for some time. Since my return from my trip to France and visit with Bernard, I have been able to retain those adjustments I learned on the mechanical horse. And, I have been able to go in with practicing the finessing of the in and out of those centrifugal turns while teaching young horses their form. My travelling companion to Bernard’s farm was none other than Jeanne Boisseau, who served as ADC to Mr. Oliveira and is author of a fine book that is her memoir of her meetings with the finest ecuyers of her generation. The last time that Jeanne rode was at my farm in Connecticut and it was on my Quarter Horse stallion Vousy. That ride came after many years after not having ridden and yet she was gamely cantering in place. At one point, she hit the pirouette button by mistake but stopped it using her Oliveira-coached seat and then went into a perfect levade. In her effort to get out of the levade, Jeanne triggered Vousy’s rollback – thus inventing the levade spin, guaranteed to stop cows and dressage judges in their tracks! Jeanne’s balance memory was such that decades after her formation as an amateur, she never left the saddle and followed the horse until he stopped and looked at her to ask if this combination was REALLY what she meant to do! Jeanne also tried out the mechanical horse so that I could sit in and see how Bernard coached an amateur who has not been actively riding. It was very helpful for me as I often do not read well enough the tensions that are caused by fears of lack of balance nor the limits on older riders stretching leg positions. 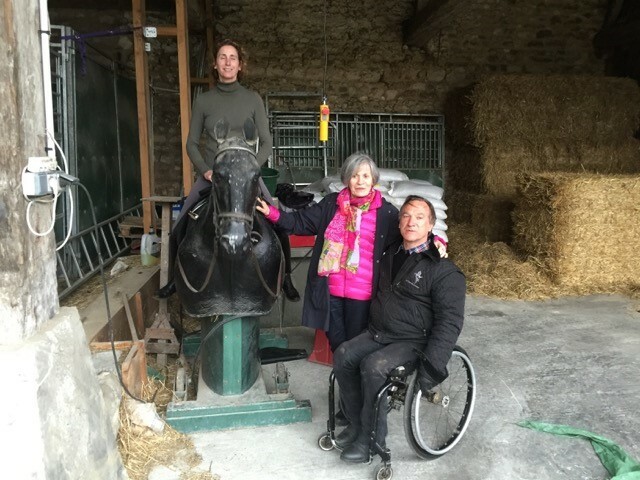 Bernard put Jeanne through a very simple combo of feeling the shoulders going to three different angles and then turning them around feeling her inside leg position, this at all three gaits. Neither she nor I felt the slightest sciatica pain and my sciatica strain was diminished by three quarters after this intervention. It is always inspiring to share research on techniques on how to align two sentient beings together, as well as spend quality time talking of art and horses with someone who believes as I do that the two are intrinsically linked. Bernard’s wife Agnes has the most joyous glow when with a horse and it was a pleasure to be able to respond to the wish of both these fine riders and caring teachers to perceive some of what I gleaned from my time with Master Oliveira. I think that he would have liked to speak with them and watch them speak to their horses. As I left their arena, after helping Bernard refine his diagonal balance through his ribcage and finesse his left pirouette, I thought gratefully of all my teachers and healers who made it possible for me to continue on, even diminished from my younger self as a fine rider. It is such that my experience proved to be a benefit to Bernard – a man who so longed to ride again that he simply refused to not ride again. All the efforts on the part of my healers, especially that of Wendy Murdoch and Dr. Du, allowed me to see the human response to the equine need to stay in kinetic motion, especially in the halt and almost halt…… This allowed Bernard to ride to a movement pattern he remembered before he was injured. His mechanical horse allows that imagination to take over as well. This is what horses do for us – keep us in touch with our past by insisting by their very nature that we are in the present with immediacy, alacrity and the notion to be of service to their balance. It really is the best job in the world.